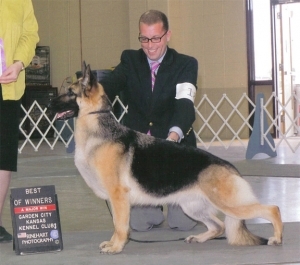 “Mandie,” shown above finishing her Championship at 2, under Mr. Chip Rayner Jr. at the Tar Heel Circuit, March 2009. 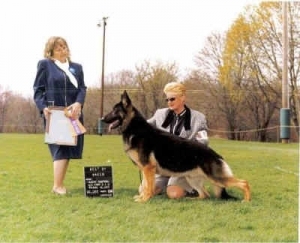 Mandie finished her championship in less than three months. 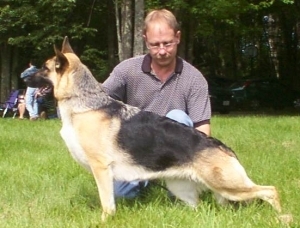 She is the repeat breeding of CH GretchAnya’s Geronimo OFA EXC. 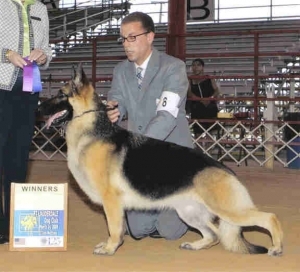 A very flashy black and tan with a stunning type, beautiful headpiece and expression, dark eye, hard back, short, strong hocks . . . and, oh, that attitude! In residence with the Conroy family. 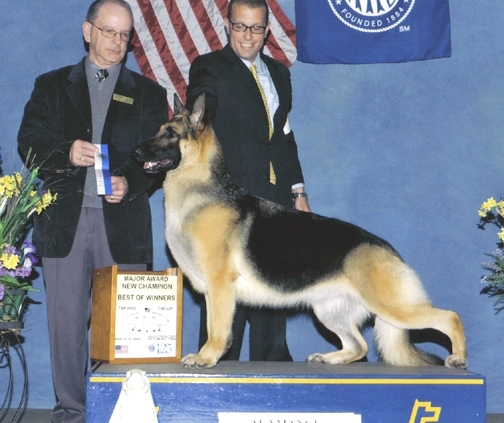 Jan. 24, 2009 – Major Reserve under Mildred Bryant – first time out with new handlers Lenny Brown and James Moses. Feb. 13, 2009 – WB/BOW/BOS – Thank you Dr. Ruby Hertz. Feb. 14, 2009 – WB/BOS – Thank you Walter Sommerfelt. 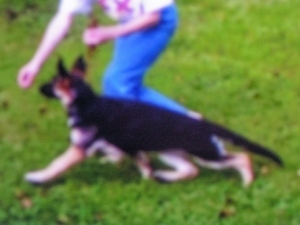 March 5, 2009 – WB, 2 points – Thank you Lenora Riddle. March 6, 2009 – WB, 2 points – Thank you Sonny Ambrosio. March 7, 2009 – WB, 3-point Major – Thank you Charlotte McGowan. March 14, 2009 WB/BOS – Thank you Judith Goodin. March 15, 2009 WB/BOW/BOS – Thank you June Penta. March 18, 2009 WB/BOW, 2 points – Thank you Roberta Campbell. 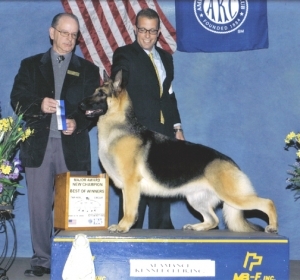 March 19, 2009 – WB/BOW, 3-point Major New Champion – Thank you Chip Rayner. Wreaking havoc wherever she goes!